“Monthly Social Security and Supplemental Security Income (SSI) benefits for more than 66 million Americans will increase 2.0 percent in 2018. You can add the 2.0% COLA by multiplying the current award amount by 1.020. For management staff, be sure to apply this COLA to benefits for the appropriate number of months. If you have already processed files for move-in for January 2018, it is recommended that you review the household income and apply the COLA to benefits issued by the Social Security Administration since it is a known anticipated change in income. There will be no cost-of-living (COLA) increase for Social Security this year. “With consumer prices down over the past year, monthly Social Security (SS) and Supplemental Security Income (SSI) benefits for nearly 65 million Americans will not automatically increase in 2016.” – ssa.gov This means that managers will not be required to add an increased amount of SS or SSI to TICs this year. Calculation Sheets are your friends. One thing that makes my job easier as an auditor is when a file contains a calculation sheet. This page is basically a summary sheet of all the calculation tapes in your file. However, a common thing we find is instead of an actual calculation, we see is “Total x1 = Total.” ( ie: Employment – $31,200 x 1 = $31,200). As opposed to “Employment – $15 x 40 (hours) x 52 (weeks) = $31,200”. This doesn’t show us your work or explain where you got your numbers. Even if there is a calculation tape further on in the file, it’s helpful to show your work here as well. Winter is coming! According to the National Weather Service, El Nino is in full effect and it will be the strongest El Nino of the last 50 years. This means good news for the Northeast – where I reside – and bad news for everywhere else! California is expected to be much more active weather-wise this winter. They will get significant precipitation in the form of both rain and snow. This could result in mudslides and flooding, which is bad news for areas with recent burn scars from wildfires. There will be less lake effect snow for the Great Lakes Region and a milder winter for the Northeast. The Southeast can expect a much stormier winter than usual. They are expecting this to have a serious impact on weather throughout the all of North America, so pay close attention to your weather forecasts and plan accordingly. Flexibility is important on inspection/audit day. Keep in mind that most inspectors book multiple inspections/audits in one day. In Massachusetts we do up to four or five smaller properties in a day. We have a lot of ground to cover each quarter. So this means we’re often running a few minutes late and even more often a few minutes early. So be sure you provide your inspectors with good contact phone numbers so they can keep you updated on our status. Also, it’s a good idea to give your inspectors information as to where they should park when they arrive. This information can often be the difference between arriving on time and being late. If they need to park in a public lot or garage blocks from the property, knowing this in advance will allow them to factor the time to park into their travel schedule. We always do our best to be on time, but traffic and Mother Nature often work against us. So being flexible on inspection day will make everyone’s lives a little easier. Spectrum staff is often asked to provide guidance to individuals with questions about acquisition rehab LIHTC deals. This article will attempt to answer some of the fundamental questions that arise when a housing professional is responsible for an acquisition/rehab deal for the first time. The article will also address ‘resyndication’ scenarios where an existing LIHTC project receives a subsequent allocation (after the initial 15 year compliance period ends). Will tenants need to relocate due to construction? Properties may receive Tax Credit funding primarily as either new construction or acquisition rehab. New construction is pretty straightforward (the developer is building something from the ground up). Acquisition rehab is more complicated. An owner can receive tax credits both on the acquisition (purchase) and rehabilitation of an existing building. The building could have existed previously as apartment housing or it could have been something else entirely such as a school or a factory and is now being repurposed for affordable housing. If the building was not formerly apartments (is not currently occupied) the process of certifying tenants is similar to new construction. You are typically looking at a substantial amount of construction work needed to get the building ready for occupancy. Once all construction is completed the manager begins marketing and lease up as if it was new construction. However many acquisition rehab credits are awarded to existing apartment buildings. Since these presumably already have things such as kitchens, bathrooms, and furnaces no major construction is needed. As a result, we see many situations we call “in place” rehabs. This means the apartments are already occupied. There is no need to market the property and lease it up as a brand new project. Your tenants are already living there. This is where a lot of confusion exists. Although you don’t need to market the building and fill all the units, you do need to certify your existing tenants. A key date is the date of acquisition. This is the date the new owner purchased the property. Many people get confused here believing the same owner is in place. However, in most cases a new partnership is formed that purchases the building. While it may be the same names and faces – there is usually a new ownership entity that is created to purchase the property. A manager needs to know the date of acquisition. Some useful tips include notifying all tenants about the need to be income certified. Make sure to tell them about the improvements they will experience as a result of the construction work. Make sure to also inform them of the possible noise, dust, and workers that will be at the site. In order to start the process of mass certifying all tenants you might plan a pizza party or BBQ and invite all tenants. Make sure to provide additional staff from other sites managed by your company. This is a good way to start getting questionnaire forms completed and the paperwork started. Do not worry about the fact that your TIC forms will show an effective date that precedes the income/asset verifications, affidavit forms, and TIC signatures. This will not be noted as a problem by a compliance auditor. There is no need to back date anything in this process. Example: Owner purchases a building in March 2015. The Jones tenant in unit A01 is income qualified and a full certification package is completed. Construction begins in March 2015 and is completed in March 2016. Owner will begin taking credits in 2016 however Jones started a new job in December 2015 with enough income that he is over the limit. Because an acquisition certification was completed the owner can include unit A01 in the applicable fraction used to claim credits. However, if the owner waited until 2016 to certify the tenant the unit would not be credit qualified. This safe harbor is not a requirement of the program, instead it is common sense and has largely become an industry standard. In other words, why wouldn’t you certify your existing tenants at time of acquisition in order to lock them in as income qualified tenants in case they later go over the limit? Some rehabs take a long period of time between the owner purchasing the property and the start of the credit flow. Anything can happen during this period so it is good to have this safe harbor protection. The safe harbor protects income only. The household must remain student eligible throughout their tenancy to be considered LIHTC qualified. Owner must keep the unit rent restricted to receive the safe harbor protection. Manager does not need wait until the date of acquisition to begin certifying tenants. If the manager has access to the files before the acquisition date they can begin the process 120 days prior to closing. In a situation where there is no management change and the acquisition date is well communicated (not delayed) you have a period of 240 days to certify all existing tenants. Even at a large community this is plenty of time to complete the process provided you have adequate staffing, communication, and planning. In a situation where the acquisition occurred prior to September 3 and the following year is the 1st credit year you will need to “test” the income of all tenants between September 3 and December 31. This test is for the purposes of the available unit rule. There is no need to completely re-certify all tenants; instead you simply need to contact them to find out if their income has changed. Be sure to note your files. See IRS 8823 Audit Guide pages 4-25 and 4-26. WHAT INCOME AND RENT LIMITS DO I USE? Use the income limits in effect on the date of acquisition for all TICs that you complete within the 120 day window surrounding the date of acquisition. For any TICs completed after 120 days use the income limits that correspond to the TIC effective date (the TIC effective date will match the date all paperwork and signatures were finalized). WHAT IF AN EXISTING TENANT DOES NOT QUALIFY? You may find that you have existing tenants that have too much income to qualify, or they might be ineligible full time students. Hopefully the owner was aware of this ahead of time and did not structure the property as 100% LIHTC (check the tax credit application and the partnership agreement to see what commitments were made to the state agency and the investor). In that case you would simply treat the household as market rate (i.e. no credits would be claimed). However, owners often believe all of their tenants will qualify so they structure the property as 100% affordable. In that case you could negotiate an incentive with the tenant to voluntarily leave the apartment so you can re-rent to a qualified household. It is very important to note that you may not simply evict or not renew leases without good cause. For a detailed explanation of the ‘good cause’ requirement see IRS 8823 guide chapter 26. Make sure the household chooses to leave in a voluntary manner and be aware that some households may simply choose not to leave despite your best efforts. In those cases the unit is treated as an over-income non-qualified unit. Tip: talk to over income tenants about home ownership. Work with them to provide tools needed to qualify for a mortgage and choose a realtor. See if your state housing agency provides programs for prospective first time home buyers and set this up at your site. Offer ineligible tenants moving services from local companies, truck rentals, packing boxes, etc. Offer them other apartments in communities you manage they might qualify for. Offer cash in exchange to leaving the site. DO NOT work with them to manipulate their income in order to qualify! Tip: Make sure paperwork is clear in notifying tenants of their right to remain in the unit. WHAT IF I CAN’T GET EVERYONE CERTIFIED WITHIN 120 DAYS? For a variety of reasons you may not be able to get everyone certified within 120 days. There’s no need to panic here or worry about lost credits or noncompliance. This simply means you no longer have the protection offered with the safe harbor. Instead of using the acquisition date as your TIC effective date, you should instead use the date that you fully completed the file after obtaining all verifications and signatures. The balance of credits not claimed in year 1 can be claimed in year 11. Be sure to check your partnership agreement to see the credit delivery committed to the investor. A downward adjuster is possible depending on how aggressively this was structured. For tenants relocated offsite the owner must pay all moving expenses. Tenants cannot pay more than than the restricted rent they would be paying while on site. The IRS has provided informal guidance that offsite relocation may not last more than 6 months (check with your HFA if you are relocating tenants off site). It is more common to see tenants relocated to units at the same property. This can either be a temporary relocation where the tenant will return to their original unit or a permanent relocation where the tenant will stay in the new unit. If the tenant will temporarily move out of their apartment to another unit in the same project while their unit is rehabbed the manager does not need to complete any additional certification paperwork. Example: The Smith household in unit 101 is temporarily moved to unit 105 while contractors replace the carpeting, windows, and kitchen cabinets. This work is completed within 2 weeks and the household then moves back into unit 101. If a tenant is going to permanently relocate to a different unit in the same project their TIC and lease status move with them. Owners will usually do a ‘rolling rehab’ where a portion of units are empty upon acquisition. For example – a building might have tenants in all first floor units but the units in the 2nd floor are empty when the building is purchased. Construction crews will rehab the 2nd floor units first. After this work is done the 1st floor tenants are transferred to 2nd floor units and then the construction crews begin work on the 1st floor units. Example: an owner purchases a building on May 1, 2014 and certifies the Jones household in unit 1-1 (an un-rehabbed first floor unit). During June, July, and August the owner completes all rehab work for the “empty” 2nd floor units and the Jones household moves into unit 2-1 on September 1. There is no need to conduct a full income certification for Jones at this time. However, a new TIC form should be printed and marked “Other – Unit Transfer” to note the move. In this example unit 1-1 is qualified for the months of May/June/July/August. Starting in September the unit becomes “empty – never qualified” because it swaps status with 2-1. After construction is completed and an eligible tenant moves into 1-1 it becomes qualified again. Unit 2-1 is “empty – never qualified” for each month until September. Starting in September the unit becomes qualified with the Jones household living there. With all tenant relocation during rehab it is critical to keep a record showing the status of each unit during each month. You need to record who resides in the unit each month; whether they are a qualified household (income/student status/rent); and whether the unit is suitable for occupancy. Keep track of qualified vacant units as well. Keep track of all tenant relocations from one unit to another. This is required in order to compute the first year applicable fraction which determines the credit amount. For an in depth explanation of this and to see an example of a chart you may use please see IRS 8823 Audit Guide pages 4-28 through 4-30. We often see poor record keeping in this regard. On a final note regarding tenant relocation the management team must be aware of the special rules used by the IRS to define a “project.” This only occurs where a property has multiple buildings so if you just have a single building you can ignore this. With a multiple building site the owner makes an election on their IRS 8609 forms whether to treat all buildings as a single project; or to treat each building as a separate standalone project; or something in between. For instance, you could have a 10 building project purchased in 2013 where buildings 1-4 are rehabbed by the end of the year. The owner could designate these as “Project A” while choosing to treat buildings 5-10 as “Project B” due to being rehabbed the following year. In this situation a tenant may not simply “transfer” from a unit in Project A to another unit in a Project B building. Instead, the manager must treat this as a move out and a new move in. The household must be fully certified when moving into the new unit. The units would not swap status and the income cert would not follow the household where they transfer to a building in a different “project.” For more explanation of this refer to IRS LIHC Newsletters #15; #26; #27; #29; and #39. It is important to note that at the time of rehab, the owner has not completed the election on the 8609 (line 8b) that will define the project. Management should confer with the owner to determine what elections will be made prior to moving tenants between buildings. The term “Resyndication” is used to describe an existing LIHTC project that receives a subsequent allocation of credits. This can only happen after the property completes the initial 15 year compliance period. In other words, the owner cannot receive an allocation of credit in year 2008 and again in 2014. Once a property receives a 2nd allocation of tax credits it is critical to examine the income and rent limits being used. Often a site has been operating under the first allocation using HERA or HOLD HARMLESS income and rent limits from previous years. These limits could have been established in a given area a few years ago where area limits then began to drop. Upon receiving a subsequent allocation of credit the property may no longer receive the HOLD HARMLESS protection and must use income limits that correspond to the new placed in service date. In some cases the tenant rents being charged will need to be lowered. And, the income limit for admitting new tenants will be lower as well. Finally, the subsequent allocation can still use the gross rent floor as established when the 2nd round of credits are initially allocated to the new owner (if higher than new placed in service amounts). WHAT IF A HOUSEHOLD IS OVER THE INCOME LIMIT? With resyndication there is a concept known as “Income Grandfathering.” A project might include some units occupied by over income households as of the 2nd credit allocation. As long as the household was previously income qualified when they first occupied a unit (during the initial LIHTC compliance period) they may be used as a qualified household for the new round of credits. Please refer to the discussion on page 4-26 of the IRS 8823 Audit Guide for more explanation of this topic. It is critical that the initial move in file is intact and well documented. Some states allow annual recertification files be used if an initial move in file cannot be used (note: the recert must include full 3rd party income verification). Although previously income qualified households are protected, there is no such protection offered to full time student households or to units charged a gross rent that exceeds the applicable limitation. ARE FULL INCOME CERTIFICATIONS NEEDED? Due to the concept of income grandfathering, a site is not required to complete full income certifications of previously income qualified households to coincide with the new acquisition date. This is true regardless of whether each household is currently within the income limit or above it. Instead of completing full income certification packages, the site may rely on the original move in files under the former credit allocation. In some cases these files can be several years old. Spectrum would urge all owners, managers, and investors to conduct a full review of those files to ensure all paperwork is intact and free of errors/omissions. If resources are available, we would prefer to see all households fully certified to coincide with the new allocation of tax credits. The protection offered to previously income qualified households should only be used where needed – with current households that are over the income limit. Before making a decision *not* to certify existing tenants be sure to speak with your state agency and tax credit investor as they might require this. After the 15 year compliance period ends, some states allow properties to rent units to full time student households. Upon receiving a subsequent allocation of credits the LIHTC units may not be occupied by non qualified full time student households. Documentation is needed to demonstrate compliance with the full time student rules in conjunction with the new round of tax credits. Some properties must lower the rent charged to existing households upon receiving a subsequent allocation of credits. It is critical to maintain and provide clear documentation showing when the rent was lowered. If the site is choosing to complete full income certifications this can be recorded on the new TIC form. However, some sites choose not to complete new TIC forms so we have to examine documents such as ledgers to see compliance with this. TIP: if you are planning to resyndicate your property and rents will need to be lowered, we suggest examining ways to use the rehab funds to increase energy efficiency at the site. You may be able to offset the rent reduction by lowering the overall cost of utilities paid by the tenants. In the last week two retail giants, Walmart and TJX Companies, have announced plans to increase pay for workers in 2015 and 2016. How does this affect the LIHTC program? Anticipated income. SCHEDULING: Employees may have a more fixed schedule, more advanced notice of their schedule and more opportunity to pick up additional shifts. With 5,163 Walmart and Sam’s Club locations in the US there is likely one in or near your community. According to CNN this pay increase will impact roughly 500,000 full-time and part-time Walmart associates. On February 25 TJX, the parent company of TJMaxx, Marshalls, Homegoods and Sierra Trading Post, announced plans to increase pay to at least $9/hour beginning in June 2015. In 2016 all workers will see their pay increase to at least $10/hour, (Bloomberg, Wall Street Journal). TJX Companies have over 3,200 stores worldwide with 191,000 employees. Annual Income was not properly calculated. The manager/owner did not include a source of income, such as a raise, overtime, or bonus. When reviewed, a correct calculation indicates that the household was not income eligible at move-in. (page 4-33). Where the amount and date of the Walmart and TJX increases are known the increases should be applied to anticipated earnings. For current Walmart associates we know their pay will increase to at least $9/hour in April and to at least $10/hour in February 2016. For TJX employees we know their pay will increase to at least $9/hour in June 2015. Spectrum is advising Property Managers to attempt 3rd party verification to determine if the applicant/tenant will be receiving an increase higher than the $9 & $10/hour. While Walmart & TJX use the Work Number for 3rd party verification we have seen some stores complete the EV. Property Managers may also be able verify over the phone or the applicant/tenant may have written documentation regarding their specific increase. The 8823 Guide states, “Owners should use due diligence by asking follow-up questions when the income certification process reveals unusual circumstances suggesting additional sources of income,” (p. 4-33). If the actual raise cannot be clarified the minimum increase to $9 and $10 should be used. To be conservative this should be applied effective April 1, 2015 & February 1, 2016 for Walmart employees and June 1, 2015 for TJX employees. The date of the second increase at TJX increase has only been announced as “2016.” The statement from Walmart regarding department managers is also vague. It says only that “some department managers” will see an increase in pay to $13 & $15 per hour and gives “this summer” and “early 2016” as the time frame. Spectrum does not feel that these alone are a known increase. Property Managers should exhibit due diligence by following up in these instances to determine if the applicant/tenant falls into the “some managers” category and if more specific increase dates are known. Ann is moving in to a LIHTC unit on 3/1/15. The manager has obtained a Work Number printout to verify her income at Walmart. The file documents attempts to 3rd party verify any additional increase via mail and phone. No additional information was available from Walmart or the applicant. 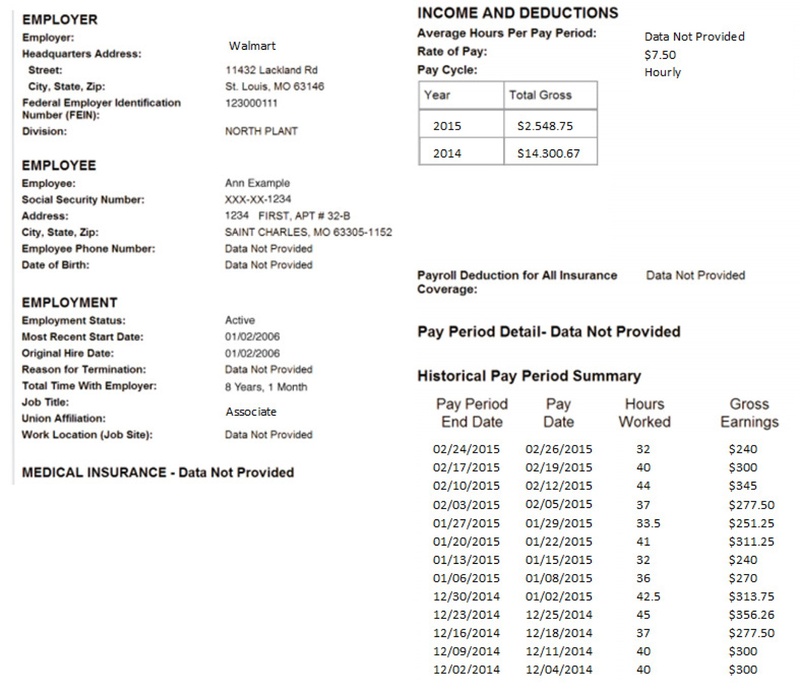 The Work Number printout shows Ann is an associate who currently earns $7.50/hour. When calculating her income you would use the current rate of pay for 4 weeks (3/1/15 to 4/1/15), the increase to $9/hour for 44 weeks (4/1/15 to 2/1/16) and the increase to $10/hour for the remaining 4 weeks. The Date to Date Calculation at timeanddate.com is a useful tool. For Year To Date calculations or if gross earnings include shift differentials you may want to apply the % of the increase to the average. The slight variation between the 2 calculation methods is based on rounding. I rounded to 2 decimals points for this example. Neither Walmart or TJX have addressed if increases will be given to current employees who already earn more than $9/hour. Again, Property Managers should exhibit due diligence by following up in these instances. For new Walmart associates we know their starting pay will be $9/hour. Spectrum is advising Property Managers to apply the increase of $10/hour after 6 months with the assumption that the applicant/tenant will successfully complete the training program. The new Walmart scheduling system could be helpful when verifying income. Walmart employees will have access to their schedule for the upcoming 2.5 weeks. This may be especially helpful if someone has recently begun working or if their hours have recently changed. Property Managers will want to follow up with applicants/tenants to determine if they anticipate picking up more shifts as the new scheduling system will allow. The new Walmart plan also allows employees to begin contributing to their 401K on their 1st day of employment. Make sure you are verifying this as an asset and questioning if the employees have access to the asset. The statement from the Walmart CEO says that the company will continue to give quarterly bonuses to full and part time associates. Please make sure you are questioning bonuses and looking at historical data if available. Rev Proc 94-65 allows the use of a tenant signed affidavit to verify assets if the household total net value is lower than $5,000. In 2000 as part of the LIHTC compliance Best Practices effort the NCSHA distributed the form Under $5,000 Asset Certification which has become widely used. Please note there is a section in Rev Proc 94-65 that explains this form may not be used to verify assets ‘if a reasonable person in the Owner’s position would conclude that the tenant’s income is higher than the tenant’s represented annual income.’ If a tenant/applicant clearly misrepresents their income, 3rd party verifications of all assets are required. Am I Required To Use This Form? Generally you are not required. This form is an option. It was meant to reduce the paperwork burden in certifying low income tenants. You may choose to obtain other verification such as 3rd party forms instead of using the affidavit. There is no Code requirement to use both 3rd party and the affidavit. However, many management companies have decided they want their files to be very strong in documenting income and assets. So you may have a company policy mandating the use of the Under $5,000 Asset Certification affidavit. Remember that this form should definitely not be used for a household whose assets exceed $5,000. Remember the form may be used to satisfy the verification requirements for the LIHTC program only. It may not be used to verify assets for programs such as HUD, HOME, RD, Tax Exempt Bonds, etc. Spectrum Compliance Analysts spend a lot of time writing up issues surrounding the use of this form. We spend a lot of time discussing this on the phone with people who are confused on how to correctly use the form. Here is a list of the more common issues we see. Do not use one form per person (except in California where the state has adjusted the instructions for using this). Use one form per household; make sure all adults sign the form; make sure the form lists all household assets. The form contains an either/or statement to demonstrate if a household has disposed of any assets in the past 2 years for less than market value. Please make sure one of these boxes is checked. Please make sure both boxes are not checked. The form contains a line for certain households to certify they have zero assets. This should not be checked for a household with bank accounts, cash on hand, pre-paid debit cards, or any other asset(s). The form provides a space to list the cash value, the interest rate and the income for each asset. We see a lot of forms where this calculation is completed incorrectly. Multiply the balance by the interest rate to derive the asset income. This should be completed for all assets listed. The form also provides a space at the bottom to list the total income from all assets. Add up the income from each asset and list the total. Do not leave this space blank. The total household income from assets is often incorrect. Households use this space to list the total value of their assets, or their annual (non-asset) income. Check that the answer is a sum of the income listed from each asset. Many households check that they have no assets, but have also listed checking and savings accounts. Applicants mark the form for both answers to the assets disposed either/or question. Effective 2/1/2015 there is a new imputed rate of interest on cumulative assets to be used for all households with over $5,000 in assets that is 0.06%. Households whose assets do not exceed $5,000 will continue to count the actual income from their assets. Social Security and other benefits are typically disbursed electronically on prepaid debit cards. This is an asset that requires verification, but many applicants forget to disclose it. If a household is receiving Social Security, TANF, or any other form of assistance, ask how they receive their payments. There is a space for “Other” on the list of assets where prepaid debit cards can be listed. This form is an affidavit certifying the value of a household’s assets. The tenant should be filling this form out themselves. If doing 3rd party verification of assets & the Under $5,000 Asset Certification form, don’t worry if the amounts do not match. Managers must review the form to see if all disclosed assets have been included and provide guidance if needed. They should not be completing this affidavit on behalf of the applicant or resident. Establishing family size is an important first step to determining household eligibility. Family size determines the appropriate income limit for the household. Change 4 to the HUD 4350 Handbook made some changes to family size determination. Specifically, it removed foster children and foster adults from who to exclude when determining family size for income limits. The change regarding foster children and adults was a removal of a statement rather than an addition of a statement. As you can see “b. Foster Children or foster adults” has been removed and the bottom right shows the 8/13 date. Foster Children: Children that are in the legal guardianship or custody of a State, county, or private adoption or foster care agency, yet are cared for by foster parents in their own homes, under some kind of short-term or long-term foster care arrangement with the custodial agency. These children will generally remain in foster care until they are reunited with their parents, or until their parents voluntarily consent to their adoption by another family, or until the court involuntarily terminates or severs the parental right of their biological parents, so that they can become available to be adopted by another family. Therefore, the parental rights of the parents of these children may or may not have been terminated or severed, and the children may or may not be legally available for adoption. Foster Adults: A foster adult is usually an adult with a disability who is unrelated to the tenant family and who is unable to live alone. Example: The Miller household contains Mike, Sally and 3 minors, Ashley, Grace and Camden. Ashley and Grace are foster children. Prior to 8/22/13 this would have been considered a 3-person household when determining income limits. Since Change 4 this is now a 5-person household when determining income limits. 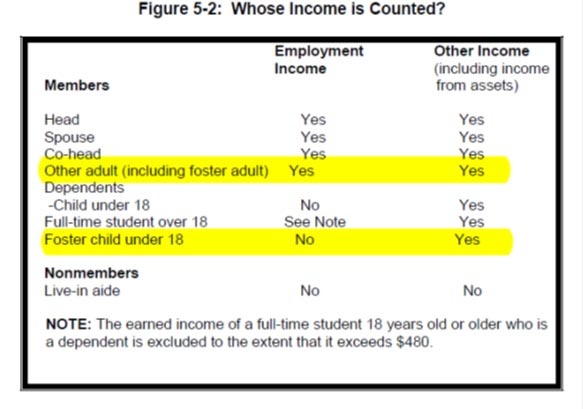 In June of 2009 Change 3 of the HUD 4350 changed how earned and unearned income for foster children was counted. Figure 5-2 was added to the handbook. Change 4 did not change this. That any employment income earned from a foster child who is under 18 years old is EXCLUDED from annual income. That any employment income earned from a foster adult who is at least 18 years old is INCLUDED in annual income. That any unearned income received by or on behalf of a foster child or adult is INCLUDED in annual income. This would include benefits such as Social Security and any income earned from an asset owned by the foster child or foster adult. Remember that “Other Income” does not include payments for the care of foster children or foster adults through official agencies. It is important to make sure your staff is aware of Change 4 so that households with foster children are not turned away for being over income when a higher income limit should have been used. Since Change 4 only live-in aides and guests are excluded when determining family size for income limits. It is also important to make sure that income and assets for foster children and foster adults are counted appropriately.